The simple way of installing the decoder without soldering, milling, filing or cutting. And, if necessary, the possibility to return the locomotive to the original condition. We made it! All additional components that are required for the sound are integrated inside the locomotive. 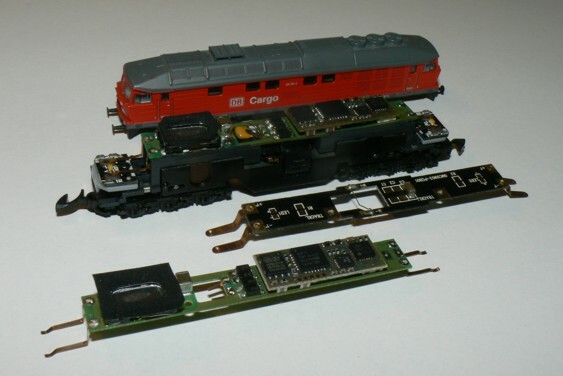 For the first time in a Z-scale locomotive the NEXT18 interface is used to connect the Doehler & Haass sound decoder SD18A and the locomotive board that provides all connections to the locomotive and the loudspeaker. For the light and driving properties the sound locomotive decoder has got the same specifications like the locomotive decoder without sound. Caution: The sound locomotive decoder doesn’t support SelecTRIX® 1configuration. To configure the decoder’s SelecTRIX® 1 parameters, please use the SelecTRIX® 2 configuration parameters. The decoder is functionally identical to the Doehler & Haass decoder SD18A. For more information about the DH10C please refer to the webpage of Doehler & Haass. Headlight and rear light changes with the direction of travel. Depending on the locomotive type, each decoder is either equipped with up to 4 light outputs to drive the original LEDs of the locomotive housing (therefore, contact latches are already soldered on the decoder circuit board) or with on the decoder populated LEDs (these LEDs are part of the decoder circuit board and replace the light bulbs of the locomotive). The light function can be assigned to any function key via configuration variables (function mapping). The intensity of the light is also dimmable by changing of configuration variables. The low beam / high beam function can be assigned to any function key via configuration variables. The intensities of low beam and high beam is adjustable. By pressing the function key, the headlight toggles between the two preset intensities. The partial light deactivation allows to deactivate the lights at a specific end of the locomotive. A typical situation where to apply this function is the push-pull operation. The headlights and rear lights pointing to the waggons must be switched off, but the other lights must be reversed in the direction of travel (white / red). The shunting gear allows a fine speed control at low speeds. Aditionally, the shunting headlights (headlights at both sides) are powered on. The shunting gear function can be assigned to any function key via configuration variables. The sound part of the decoder contains the original model-characteristic sound for each locomotive class. All sounds can be assigned to any function key and can be randomized via configuration variables and every single sound volume can be set to an individual level.